I ran into my bedroom for all of about two seconds this afternoon to grab something before running out of the house again. 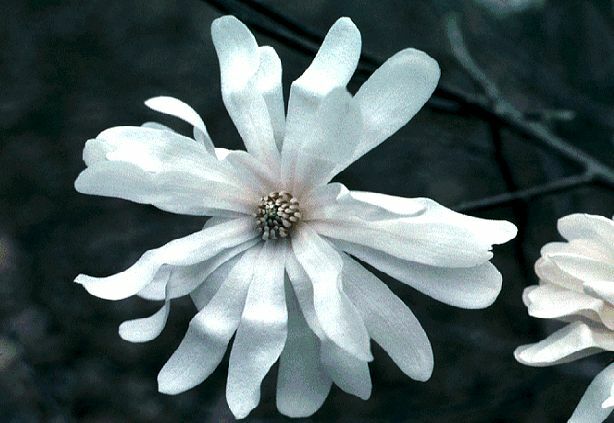 I went to get something from my bedside table and there, in the middle of it, lay one very white and beautiful star magnolia blossom. For a second I panicked when I realized that I'd been gone all morning, so who could have been in the house to place the flower there. Then I remembered that the boys had gotten home from school two minutes before I walked in. #5 had found this flower on his walk home and carried it safely here to put for me to enjoy. Aww. Just love my boys. They're good people. So glad they love me back. That is so sweet. Being a mother is the best! My son once made baskets to put on the doorsteps of several of our neighbors for May Day. One of my neighbors called me complaining that my son rang her doorbell and ran away. I reminded her of the date and told her that if she checked her doorstep, she would find a basket of flowers. She was indignant. She told me that he shouldn't be ringing people's doorbells and running away. About that time, he came in the door, tears streaming down his face. She had yelled at him. I apologized to her quickly, told her that I hoped she enjoyed the flowers and assured her that he would never leave her any more. He never again asked to give any of our neighbors May baskets. Cherish your boys' youth and innocence.